THE POSTMODERN PUGILIST'S MIDNIGHT THEATER(MIDNIGHT SPARRING, PANDA ATHLETIC CLUB, NORTH BROADWAY) There's no air-conditioning in here; just a stale mugginess that lingers, contained within these sheets of brick and glass-block windows, after a humid week. But this is Steve Smith's boxing club; of course there's no air-conditioning. In fact, this is Steve's world. Without him, it wouldn't exist. Steve's one of those rare personalities who creates around him a universe of his own design. This world suggests a grittier America, somewhere between 1933 and 1967 -- but a slightly surreal version. It has less to do with time, more to do with mythology. Steve takes elements of American mythology and manipulates them into fantastical theater. In this way, he is a kind of artist, creating around him what he wants to see that isn't already there. And like an artist, he's able to make it believable. So it is more the idea of a grittier America, Steve's idea of it, and in that world there wouldn't be air-conditioning in a boxing club like this one. Now Steve's in the ring sparring with another boxer. They shuffle around, sneak in a few punches, shuffle around. 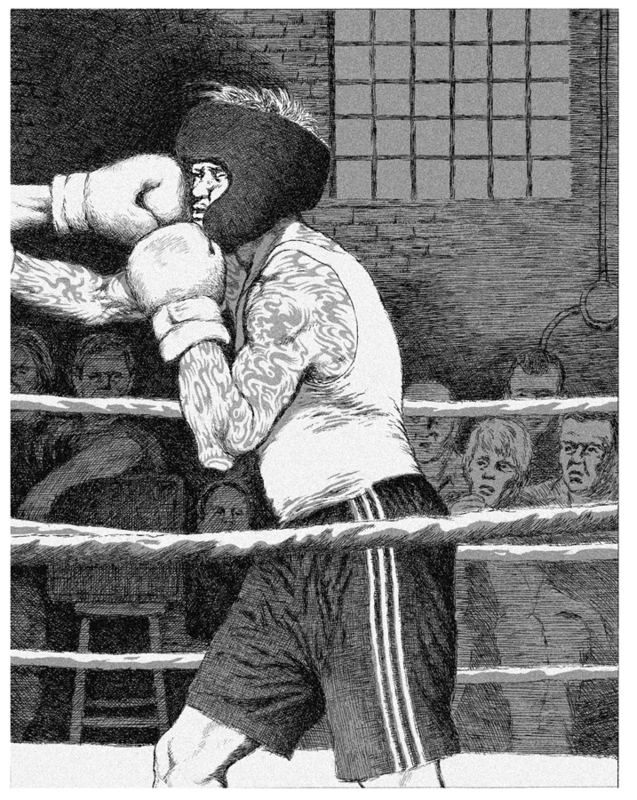 The only thing separating this scene from a George Bellows lithograph is the protective headgear. Steve goes "tsk" through his teeth with every punch -- punches that aren’t brutal, and aren't meant to be. We're here for the theater more than the fight. Steve's opponent exits the ring, leans against the wall and lets loose a blast of vomit. Then another. When I catch up with Steve later I ask if the guy's all right. "He's okay," Steve says. "He always throws up."